A good friend of mine and occasional contributor to Hynd’s Blog, Eugene Grant, has launched the first ever self-defence programme for people with dwarfism. This is a cross-post of his article that explains why he sees the need for such a self-defense course. I don’t even remember where I was going. All I remember is looking to my left, distracted by a homeless man asking for change as I walked past. When I turned my head back to the front, a tall man – about 6’ 0” – was advancing aggressively in my direction, just a few feet away, his hands outstretched towards me. I have Achondroplasia – one of the most common types of dwarfism. In 28 years, I’ve had stones thrown at my head; I’ve been chased by youths on mopeds; I’ve been grabbed and assaulted by strangers. I was frequently bullied at school. The list of instances in which I’ve been verbally abused or threatened is too long to include here. Now, I make no assumption that my experiences are representative of other dwarfs. But I know I’m not alone. Throughout my life, I’ve studied boxing, self-defense, and martial arts: Karate, Kick-boxing, Ninjitsu, and Tae-kwon-do, to name but a few. Growing up, these provided a valuable outlet for me as a frustrated and isolated young man, who struggled to deal positively with an environment that felt harsh and hostile towards me. And yet, over time I realised that so many of these forms of self-defence were completely inapplicable for people with dwarfism. Even at 4’6” – hardly small for a dwarf – my hips are at the height of most people’s knees. I’m never going to get my leg up high enough to kick an attacker in the head – as you’re taught in Taekwondo. Nor, at 7 and a half stone, would I try to grab, trip, and throw him to the floor – as you might in Judo. Like most dwarfs, my arms are short – making boxing difficult (but not impossible…). I realised that what people with dwarfism, people like me, really need is a self-defense system designed for our body types and the sorts of threats and assaults (being grabbed, picked up, bear hugged, and so on) which, sadly, some of face all too often in our daily lives. And so SPD – Self-Protection for Dwarfs – was born. 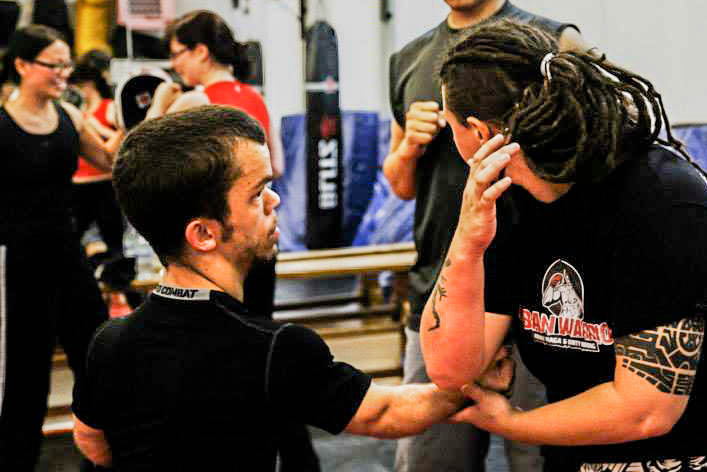 Designed and developed by myself, under the expert guidance and instruction of Urban Warriors Krav maga Chief Instructor Kelina Cowell, SPD is a unique, practical, and applicable form of self-defense for people with dwarfism. For us, by us; tailored to the modern day environment (not the battlefields of feudal Japan!). Of course there’s a desperate need for us as a society to re-evaluate how we treat those who are different; to think critically about how a dearth of real representations of people with dwarfism – and indeed other disabilities too – in the media perpetuate prejudices and spread stereotypes. But as Kelina herself has said before, the world will never rid itself of violence, abuse, and discrimination. That we also need to address structural problems like poverty and inequality, social immobility and educational disadvantage, shouldn’t stop us from locking our doors at night to prevent burglars and home invaders. Urban Warriors Self Protection for Dwarfs is a serious step forwards to helping people with dwarfism be better prepared to look after and defend themselves in times of crisis; to learn new skills and grow as individuals and as a community; and to build our self-awareness, self-esteem, and self-confidence. To me, that’s truly empowering. All we have to do now is to spread the word, teach and train others, and watch the movement grow.